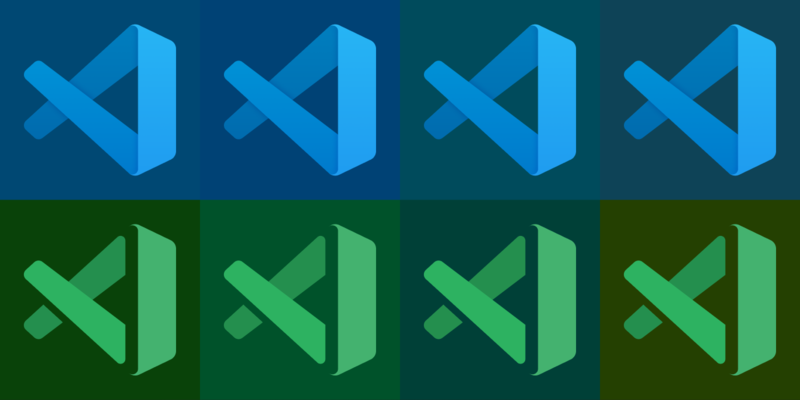 The 2017 icon change showed how much passion and interest there in the iconography for VS Code, and we thank you for that feedback. There are still a few outstanding issues with current icon, and we’ve been spending time over the past few weeks looking at ways to resolve them. We wanted to share where we are and get your thoughts. The current icon is hard to see on some customers taskbars as well as in some parts of the Windows UI like the file chooser dialog. The size of the VS Code shape itself, when wrapped within the Visual Studio Family ribbon (the “wall” on the right) makes the difference between Visual Studio and Visual Studio Code hard to spot, especially for some customers with color vision deficiency. Finally, some commented that the macOS version of the product icon looks out of place amongst other apps in the dock. As well as your feedback, there was also efforts going on inside Visual Studio and Visual Studio for Mac on aligning with iconography across Microsoft, being led by Windows and Office. 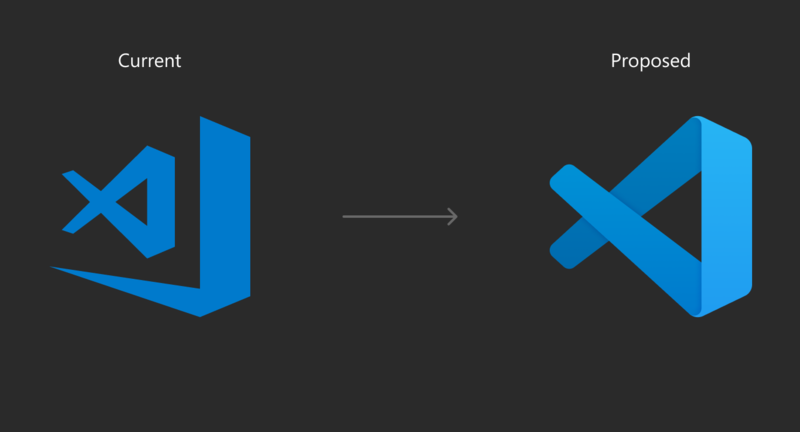 You’ll have seen some of this in the latest product icons for Visual Studio (Windows) and Visual Studio for Mac as well as some of the recent Office icon updates. While this was not our main driver of change, it made sense to learn from the other work and leverage a similar style to solve some of the issues we were seeing. We are dropping the thick ribbon on the right side of the icon. 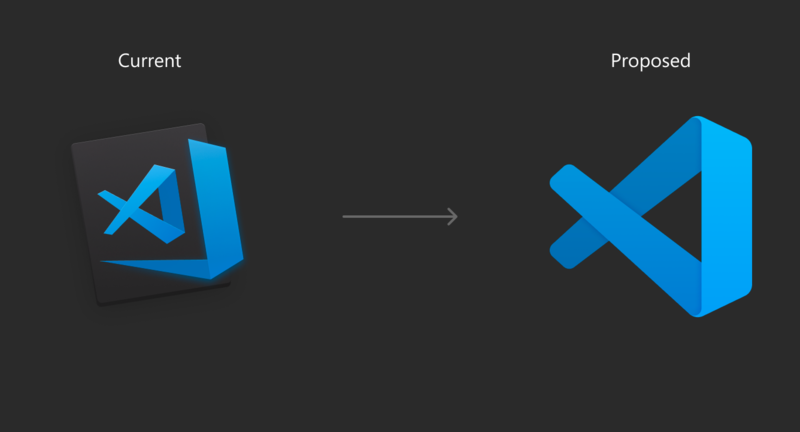 This allows us to increase the size of the VS Code shape (the key identifier of difference) to a size where it’s now a lot simpler to glance across the taskbar and spot your favorite code editor. To make the icon more legible on a variety of backgrounds (from the desktop to the file chooser), we have added depth to the icon. This allows us to using lighting and shadows to create an overlapped effect, but also has the added advantage of lifting the icon up and off many flat colors it might encounter. An example of the proposed icon on some of the blues and greens that you can choose in Windows10. To improve accessibility, we needed a something that is more than color, so taking inspiration from the other Visual Studio Preview builds, we have brought a “stencil” look to the Insiders version VS Code while keeping the familiar green. We’ve kept a macOS style icon for Visual Studio Code on the Mac. We considered having the same icon across all three operating systems but decided to follow the native Mac style. What we also wanted to add to the macOS version was a stronger connection with the Windows icon which would strengthen the recognition between the two versions. Using the same shape, as well as stencil look to the Insiders build, allowed us to do that easily. Whilst keeping the shape of the background the same for our macOS icons, we were conscious on making sure that VS Code was easy to identify next to Visual Studio for Mac so we’ve adopted a darker look for the shape. This lets you easily spot the difference if you have both installed (and next to each other) in your dock. We would love to hear your feedback on these proposals So let us know what you think! I think a color change is enough to differentiate Insider from Retail, does not have to be a different shape as well. Did you guys explore going into the same direction as the Office guys then? I thought everything across Microsoft has to follow the same scheme now? 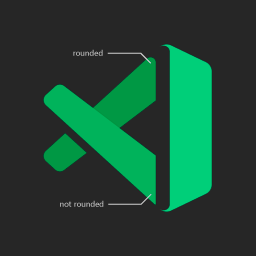 I think having the Insider icon have those cutouts opposed to the stable build makes it look too much like an X, especially a green X, i. e. Excel. Really nice icons. Its a good idea. A green X is Excel - the Excel logo never looked like that, but the Mandela Effect will be a thing. How about Orange for the insiders build? That said, I like the shape, it's in-line with Visual Studio 2019 just like the current icon is like the VS 2017 one. Just no Green X please. And maybe don't have a gap at all, in small sizes (e.g., Taskbar icon) it looks more like the icon is actually broken and is missing a column of pixels, the 3D look only works at bigger sizes for me. I like the proposed look for both stable & insiders build specifically the macos one's. I love the 3d look of the icons. However in the insider build one the stencil dark band or border can be reduced in thickness, after all only an effect. Love the idea. Both look great but I'm a lil bit biased towards the stencil look. It will make code icon standout from a pile of icons in a glimpse. Time to spot the stencil icon is seemingly less compared to the other new icon. I like what you’ve done here overall. That being said, have you considered drawing from the new Microsoft Office, Skype, etc. logos? The brand consistency might be nice. I've always wondered why the thick ribbon was there, made it look weird, these look a lot better, great idea! Most likely an oversight, but the Insiders icons in the Proposed and Windows 10 background presentations aren't rounded at the bottom part while they appear rounded in the mockups of the Win 10 taskbar and the macOS dock. macOS one looks super dope. Maybe thinner border but the proposed one still looks sweet. Love the depth of the proposed icon! Just the right level of shadows and rounded corners. I love the proposed blue icon! 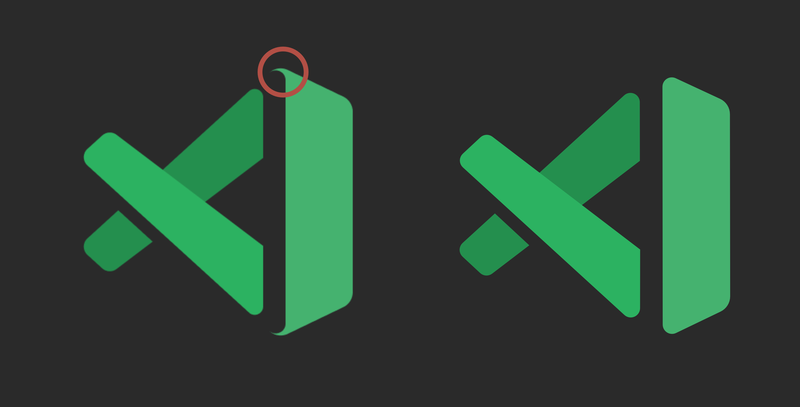 Get rid of the cutout on green icon, make it same shape as the blue icon. I wonder if some added textural elements might help to further distinguish the “Insiders” icon. For example, the Firefox Developer Edition icon adds a polygonal pattern to the globe. A textural treatment such as this for the Insiders icon might accentuate the “stencil” motif as well. Here's a quick hack with changed angles and inverted. New proposed design looks pretty awesome. However, for me, icon for macOS, especially that big background don't fit very well. Can Linux users get the regular icon instead of the Mac OS one, please? Hey @AlexAegis I wanted to address some of the valuable feedback you've been adding to this thread, you're correct in saying this is a open forum for discussion and feedback, both negative and positive. I think your point around how a product icon should reflect the ui of the product (or even the OS) is interesting but maybe limiting? Where I agree that Apple 'owned' the rounded corner for a long time, I'm not sure that's the case anymore (and I'm not sure that's how they'd like to be remembered either 😉) Similarly for Windows, I see many examples of less than sharp corners across all of our major products and I think that's okay too. Looks cool! Can't wait to see it in my dock. @jamiedawsonyoung Ah, I see. Well, it was just a thought that color and style might be too much. Either way, I do like the new logo design for Windows. However, I also find the mock-up designs by @AlexAegis and @Yzrsah very nice, too. I actually like them better than the current flat design. Nice work. Really love the logos! Would love the Mac one to match the Windows one though. Not a fan of the border. 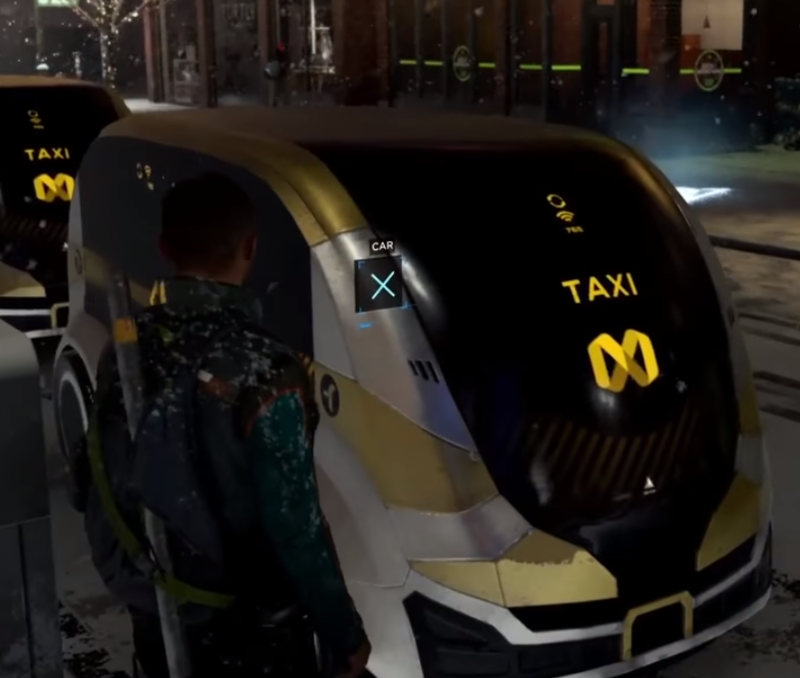 Can't we just make the style consistent across every platform? Purple for Visual Studio, blue for Visual Studio Code and green for Insiders if fine, but please don't use a different icon style in macOS! 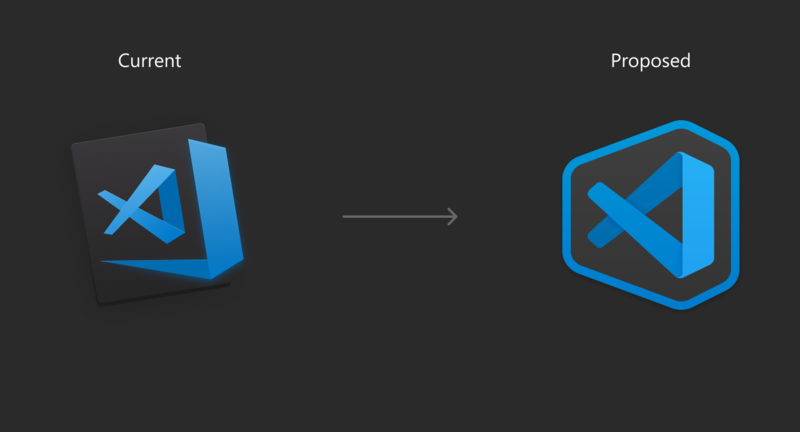 We’ve kept a macOS style icon for Visual Studio Code on the Mac. We considered having the same icon across all three operating systems but decided to follow the native Mac style. Great icons. I like the colour and the differentiation (colour and style) between regular and insiders. However I agree with the feedback that the icon should be consistent across platforms, which seems the route that other MS products (namely Office) are taking. I would prefer to see the "Windows-style" icon used everywhere; no macOS-specific icon. It's unfortunate that Visual Studio 2019 did not already go this route. Nice. When is this shipped? But it follows the Visual Studio style, so it's correct. I prefer to see an X rather than having two software of the same family (Visual Studio) with different icon styles. Can Linux get the same icon as Windows, please? but ,I like more short width edge line. Of course I think it is a very nice design. Love the new icons overall! Just a small detail on the edges of the insider icon that is bothering me a little. Maybe it would be better to have them rounded instead of (crooked)? Great work! Really love the new logos and can't wait for them to be released! As many people have said above, I would also love for the Mac icon to match the Windows icon. Not a fan of the border!